Our office support staff offers the best customer service in Austin I.S.D. If you need information about Akins High School, please call one of our office staff members and we will provide you with the correct information in a timely manner. Front Row (left to right)- Melissa Hernandez- attendance secretary; Melissa Adame- academy secretary/substitute teacher coordinator; Junior Alvarado- (transferred to other dept. ); Senaida Martinez- campus secretary; Mary Helen Garcia- front desk receptionist. 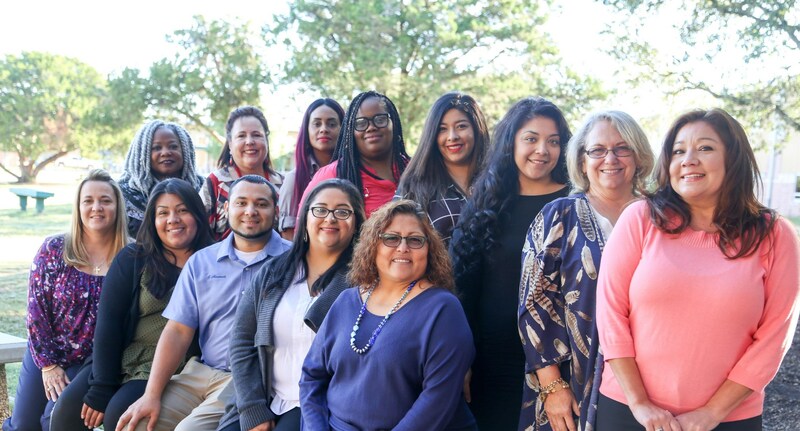 Back Row (left to right)- Mack Waegerle- data processor; Toni Holder, parent support specialist (PSS); Claudianis Soto- PEIMS clerk; Janel Aleman, bookkeeper; Peggy Wellington- registrar; Laura Garza- graduation coach; Cathy Sandoval- bookkeeper and Sandra Salinas- registrar.